Do you feel like you’ve been on a never-ending search for the “best” diet? Are you sick and tired of losing weight only to gain it all back—and then some? Chances are good that you’ve been on the weight-loss rodeo tour with more than your fair share of yo-yo dieting. After all, at least 95% of weight loss attempts fail. But why? In this episode of the BioTrust Radio health and fitness podcast, we’ll take a deep dive into why diets don’t work, and better yet, exactly what you should be doing instead. Enjoy! 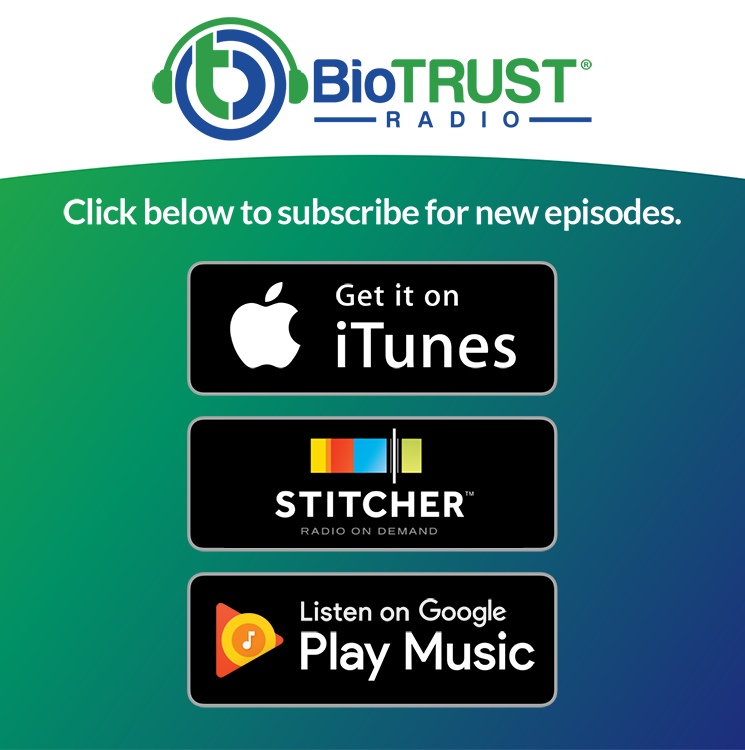 In this episode of the BioTrust Radio health and fitness podcast, Shawn and Tim cover the controversial topic of why diets don’t work. They’ll dig deep into why most people have trouble sticking with a diet, struggle with weight regain, and feel like they’re constantly yo-yo dieting. What it means when we say diets don’t work. For most people, it’s not just about losing weight; it’s about keeping weight off. Even though it’s cliché, it’s comes back to lifestyle changes and behavior modification. One of the biggest factors is mindset. Most people go into it with the mindset that the diet is short-term. That thought process is self-sabotaging. You’re already telling yourself that you only have to eat healthy for a limited/fixed period of time. Behavior modification is key because long-term weight loss comes back to building healthy habits. Instead of a complete overhaul of lifestyle, focus on working on one or two things at a time. Diets are short-term; healthy living is a practice just like being a great athlete, artist, mom, or business person. Instead of viewing past experiences as failures, view them as learning experiences. How can all of your previous dieting “failures” actually be used in your favor? Failures are just part of the experiments in this journey called life. Get rid of the all-or-nothing mindset and attitude. Being healthy is NOT black and white. We’re not perfect. Identify your triggers, including emotional (e.g., stress) and your environment (e.g., TV) triggers. On the flipside, identify your positive triggers. What things, people, or places trigger healthy behaviors? Highlight the bright spots. Look at the people around you. Are they supportive, encouraging, and helping you maintain accountability? Or, are they toxic and bringing you down? Look at how you’re talking to yourself. Do you find yourself engaging in self-sabotaging talk? Or, do you focus on words of affirmation? Shawn: All right. Welcome back to BioTrust Radio. I am Shawn Wells, and I’ve got my trusty, brilliant, handsome host, Tim Skwiat, here with me. Shawn: And we want to roll into a pretty cool topic. I think this one might pique your interest, “Why Diets Don’t Work,” hmm. Uh-oh You know, BioTrust, we’ve talked a lot about diets. We have articles on diets. I’m a dietitian. Tim’s a nutritionist. What do you mean, “why diets don’t work”? Is this clickbait or this is this real, Tim? Tim: This is our headline-grabbing attempt at getting your attention. What I mean by this is that diets, in general, are very effective in the short-term at producing the desired result, which is weight loss. Tim: Maybe to take a step back, when we eat, whatever we eat. That’s really considered our diet. But I think most people have the idea of diet being a means to an end in terms of a weight management goal. Tim: And so, in general, diets are very effective at getting there, provided that you stick to them, which is an important criteria. Because weight loss is contingent on burning more calories than you consume, and diets typically provide some structure and rules, raise awareness, and things like that, which we can get into why they are effective. But they typically get us there. However, most people don’t just want to get to a place, they want to stay there. Tim: And that’s where diets seem to fail and why diets don’t work, is to get people. And it’s probably not a function of the diet. It’s probably more of a user error, if you will. Shawn: Hm, that’s true, that’s true. For example, The Biggest Loser thing gets thrown out a lot, that even in those cases where they had all the instruction, they had the support structure, they had the means, they had the food they, had the access to trainers and dieticians, and they accomplish incredible results. But then they gain it back. Tim: They gain it back. Shawn: They almost all gain it back. And some, even worse than before. Kind of the greatest fear that people have or that thing that gets thrown out, this yo-yo diet effect. Shawn: You know, people have concerns of maybe if you diet too strongly or too often, that it can actually be counterproductive. And you hear terms like “metabolic damage” and right stuff like that. That’s kind of controversial. But what are your thoughts? I guess, stepping back, we should say maybe we should all learn, so you drop the term “diet,” right? Shawn: And I know everyone’s heard this a million times, like it’s about lifestyle, it’s about lifestyle. Make lifestyle changes. Well, really, that’s what you need to do. Shawn: You don’t usually just go into work for like two weeks and then stop going into work. You know, you got life, right? You’ve got to pay your bills. You don’t just take care of your kid for like three weeks and then just put your kid aside and just let them raise themselves. Shawn: You know what I mean? You need to make lifestyle choices. And I think it’s better to, maybe, if you already have a lifestyle choice of let’s say having two Coca-Colas a day and that’s part of your thing. You know, every day you have to have two cans of Coke. And if you can drop one or both, over time, and keep that permanently for the rest of your life, that’s more impactful than a four-week or eight-week diet. Tim: I would definitely say so. Shawn: And it’s also more empowering, and it helps with your goal-setting in life in general, that you that you can do something and keep it. That you can do something and achieve it, instead of feeling like I can do something in the short-term but I always undermine myself. I always sabotage myself. There’s always something, like when the S hits the fan, this all goes out the window. Like I’m going to reach for my cigarette, reach for my Coke, reach for my whatever it is. Shawn: And there it goes, right. Tim: Yeah. I’m glad you brought that up because what you’re putting into context in my mind is that they top reason why diets don’t work comes back to the mentality side of things. And first off, like you talked about, I don’t just work for like three weeks and then that’s it’s. It’s not a means to an end; however, mentality-wise, I think that most people have that mindset about a diet and that’s why diets don’t work. Tim: It’s like this is just a means to an end, right? I’m not in it for the long haul. Shawn: It’s a destination, not a journey. Tim: Right, exactly. And if you have that mindset from the beginning, you’re self‑sabotaging yourself. That finite mindset is self-sabotaging and is one of the biggest reasons why diets don’t work. Shawn: Healthy weight is a journey. Shawn: It’s not a destination. Tim: For you and me, we’re constantly refining our journey, our craft, what have you. There’s always things that we’re going to be working on. There’s always things we’re going to be experimenting with it. It’s never over. Having said that, you know, because we’ve worked on some of these things, a lot of these things have become habits. So, we are on autopilot in certain things, and so that’s the part of the idea with a lifestyle behavior modification, is working on one or two things at a time, or just one thing at a time and really focus on it, become a habit, and then it’s done. Like the Coke thing, like you said, if you do that, it may take effort, but if that’s the only thing you’re focused on for the next four weeks, to just focus on having one Coke a day instead of two, you don’t have to worry about anything else. Don’t worry about exercise, if you’re not exercising. Don’t worry about changing your nutrition. If you do that stuff, great, but the only thing you really want to focus on is the Coke habit. Over time, it’s just a habit. And then you don’t even have to think about it anymore. The other part of that, to me, that I want to emphasize is that healthy living is a practice, just like being a great athlete or being a great artist, or being a great mom, or being a successful businessperson. It’s a practice. You’re just constantly working on those things. It’s not a means to an end. Like you said, it’s a journey. I think the mentality side of things is really important when going into this, is that if you truly want to be healthy you’re going to commit to it for the long haul. That doesn’t mean you have to commit to eating a very restrictive diet, necessarily, for the long haul. But you do have to commit to these habits and these behaviors. Shawn: Right. And maybe we shouldn’t put them off to certain dates, like New Year’s, to make changes, right? Shawn: Because that’s kind of almost self-sabotaging, too. Like if you know you need to change this, then let me let me throw out a Jocko, who’s a Navy SEAL, a quote from him. “There is no shortcut. There is no hack. There’s only one way, so get after it.” It’s kind of like look, you know better, so do better. Let’s just go do it. We were talking about this. I mean, we can educate them on the finer points of exercise and diet, and there is science that comes out all the time, and we talk about some cutting-edge things. Like I could talk to you about High-Intensity Interval Training or KAATSU, like blood flow restriction, and like some cool stuff like Intra-Set Stretching and things with exercise that are cool. But if you talk to people, largely, they know at least that candy bars and certain things and desserts are not healthy to have often, and yet they do that. Shawn: Why do they do that? Why do we do that? What do you think? And they know it’s healthy to exercise, and they know it’s healthy to meditate, and they know it’s healthy to get enough sleep, and they know these healthy behaviors, in large part right. Shawn: Well, why aren’t we doing them? A lot of them we’re just putting off, like, I’ll get to that, I’ll get to that. You know, maybe when I get this app or when I get enough money and I get a trainer, or for New Year’s, or whatever. Why are we putting it off? Why do we sabotage ourselves and keep kicking the can down the road? Is this another reason why diets don’t work? Tim: That’s a good question, Shawn. I know you probably have some thoughts and answers on that yourself. It reminds me of this quote that we had talked about too, earlier, and I’m going to read it here. This quote actually was one that my wife shared with me. My wife, who’s a counselor, a therapist. This says, “I’m willing to change.” It says, “I’m willing to release old negative beliefs. They are only thoughts that stand in my way. My new thoughts are positive and fulfilling.” And I think that one of the reasons that people put these things off is because they might have had a “failure” in the past, and we have this fear of failure, right? Could a fear of failure be a reason why diets don’t work? Tim: So that could be one thing. Like you and have talked about though, I wouldn’t say there’s no such thing as failure. It’s pretty much how we view it. It’s like, do we have these success filtered glasses or do we have failure filtered glasses? In other words, do we look at our experiences as negative failures, or do we look at even those things that could be viewed that way as learning experiences, things that we can tease out. What can we draw from those so that we do pick ourselves up, get back on track, and do better. Don’t let that happen again. Shawn: So there’s several things I think of it that I love there. Because you know I like stoicism. Shawn: So, like Ryan Holiday, “The Obstacle is the Way.” That that is how you get better, that is how you get stronger. Don’t avoid the obstacles. Like you cherish the obstacles. That’s where greatness comes out. You don’t want a life devoid of stress and difficulty. Of course, you don’t want every day to be extremely and just crushing, but you do get better through that. The sunshine comes after the rain, so to speak. Shawn: He’s like, “I didn’t fail.” And if you talk to successful people, if you read books like this one I’ve got in front of me, “Tools of Titans,” with Tim Ferriss. One of the things that he talks about is that there’s two traits that successful people almost always have, that he talks about. One of which we’ve talked about is some kind of meditation technique, which allows you to put that stress into perspective, right? Shawn: Basically, it’s allowing you to take that stress, rearrange it in your mind like you just said, and say, “Okay, I can do something with this. I can either let it break me or I can take a second. I can think about it. I can move forward. I can make it a strength. How am I going to get around this stress in the future? How am I going to prevent this in the future?” And that’s so much of meditation, right? But the other one is that successful people are okay to fail, and they don’t view it as failure. They call it experiments. Shawn: Successful people experiment. Very wealthy people experiment. Very knowledgeable researchers experiment. And they’re okay because failure means you’re trying. Failure means that you’re learning. Failure means you’re out there doing it. Real failure is that you never tried. There’s a quote about one of the saddest things is all the dreams, you know, like when you look at a graveyard, like all the dreams that have died here. Shawn: Because there’s so many dreams that were just unfulfilled, unrealized because of fear. So, fear is holding us back, and failure is okay. Failure is what we should strive for. We’ve talked about Michael Jordan has missed more shots than he’s made. Shawn: You know, the greatest hitter in history, Ted Williams, was a .400 hitter, so he was swinging out more than he was. Shawn: And it’s just okay. It’s okay. It’s not all-or-nothing. And maybe there is no truly “bad food” because if you put it into perspective, just like “The Obstacle is the Way,” yes, a candy bar isn’t healthy, but if that’s what you want that one time and you plan for it, okay. That’s fine. You know, we just have to get rid of the all-or-nothing attitude. That attitude is another reason why diets don’t work. Shawn: We have to stop kicking the can down the road. We have to take responsibility for it, we have to plan for it, and we have to say that’s okay. Tim: Yeah, 100%. I mean, I think that there’s a ton of power in what you just said, and application. And I was going to talk about that all-or-nothing mindset. I think that’s where a lot of people go, even myself. Actually, I remember when I first really got into the health and nutrition side of things. That was the Body for Life, EAS stuff, and Bill Phillips would talk about eating this way Monday through Saturday, and then Sunday was your cheat day. And it was literally like my week planned on that. Tim: I would just plan that day out, and it was just kind of ridiculous, and I realized that it wasn’t healthy for me. That’s why I think another thing with the cheat days is that those apply differently to different people, in terms of how people view them. But I agree, we just need to kind of get rid of that terminology, in general, and help people realize that that’s okay. Again, if you get off track, that’s fine. Just get back on track. But also, try to raise awareness and mindfulness. If you unexpectedly got off track, what triggered that? Instead of being a reason why diets don’t work, that info can be used for success. Tim: Right? Was there some stress. People don’t think about this too often, but was it an environmental thing in terms of geography? For instance, were you out shopping at Walmart or at the store, and right across the street you saw your favorite fast food place? Well, try not to put yourself in those positions anymore, right? Or can you take a different route to work so that you don’t pass that bakery that you love to stop at, to get that pastry? Things like that can actually work in your favor instead of being a reason why diets don’t work. Jake, who was here with us earlier, was talking about how if you’re sitting in front of the TV, that’s a trigger for people to eat, and typically, not eat carrots. It’s going to be some kind of junk food, high-calorie junk food. So, just raising that awareness and mindfulness of any kind of environmental triggers, any kind of emotional triggers that might get you off-track. Those are all learning experiences. It’s not like, “Oh, screw it. I failed. I’m off the diet,” because you have that on/off thing. It’s a spectrum. It’s not on or off. Shawn: Everything’s data, if we let it be data. Your life, this journey is self-discovery, right? And people that are listening, don’t think because Tim and I are sitting here, like Tim was just saying, we struggle. There’s a reason that I got into diet and fitness. Same with Tim. And a lot of the people that you might look to as fitness icons or diet icons, or whatever. It’s not just because things have always been perfect 100% of our lives. A lot of times we struggle with some of these things, too. I mean, we’re not perfect. Shawn: We have some self-discovery and we needed education, and we needed more knowledge around this area, so that we could better ourselves and not have it be a weakness, right? Shawn: To me, that’s the best story. I want to hear from someone who has been overweight and been through the struggles—who knows what it truly means when we say why diets don’t work—instead of some guy who’s just genetically gifted and has never struggled a day in his life, and he’s going to tell me about diet and exercise? I don’t want to hear from that guy. Shawn: I want to hear from the guy who has struggled. But realize with that guy who struggled, it’s not just about the foods he says to eat and not eat, or the exercises he says to do or not do. There’s a whole mentality there, and everything is tailored to you, and there is lifestyle, and it is a lifelong journey, and you need to know what your triggers are. You need to know where your sabotage happens. You also need to know where your greatness happens. Where your strengths are. Shawn: And leverage those more. Like you said, where are those places or triggers for the unhealthy behaviors? Where are those triggers for the healthy behaviors? Identify those, and instead of why diets don’t work, you’ve found a key to making your diet work for you. Shawn: Maybe church is healthy for you, maybe exercise is healthy for you. Maybe when you’re around your kid you do better, or when you’re out walking the dog life seems better. I don’t know. Like maybe you need to change up your work hours or your schedules. There’s the meditation practice. It can be a lot of things. But think about your healthy moments, your happy moment. Tim: Right, 100% Shawn, because I think that we often really dwell on those negatives. Maybe humans are driven that way. Again it takes practice to focus on the positives. But that’s that quote that we just talked about. Tim: To really emphasize those positives. “Highlight the bright spots” is what we like to say. And do that and be proud of yourself when you do that, and do more of it. That’s another thing with diets, and why diets don’t work, they often tell you what not to do. And while I think rules are really important and I think that’s a reason why diets can be so effective is because we also like boundaries, in general. And we like boundaries often set by other people. Funny thing is the same thing that makes them effective in the short-term is also a reason why diets don’t work in the long run. However, my point there is that diets often tell you what not to do, but let’s focus on what you should do and what you should do more of. So identify, like you said Shawn, what are your strengths, and let’s do more those. Maybe you’ve tried a few different diets over the years and maybe there’s been certain things that you like about them, but certain things that didn’t work so well. Well, make up your own diet with the things that worked really well. You may need a little bit of help from a coach to make sure that you’re getting everything that you need, but that’s fine. My point is to use all those previous experiences that you have, all those things that you might have viewed as failures (that you’ve chalked up to the “why diet’s don’t work” montage), but are really just growth opportunities, and tease out the things that you did really well. What happened? Did you do meal planning and prepping better on certain things? Was it easier for you to stick to this if you had a protein shake, for instance, for breakfast instead of having to make some kind of elaborate meal, or something like that? What were the things, or the themes, at least? Maybe it’s not even just foods or things. But what are the themes? What are the behaviors that you can tease out from your previous experiences to develop this lifestyle? What worked well? Was exercising hard for you or was that an easy thing for you, or was going to the gym hard for you, but you could go walk outside for 30 minutes? What can you do? What are you ready, willing, and able to do, right? Shawn: Start where you’re at. Tim: Start where you’re at. And just focus on one thing at a time, is one important point, too. I remember when I did P90X and I’m like, “I’m not only going to do P90X, I’m going to do the double P90X.” Right? Like you could do like twice and it’s like three hours of extreme exercise a day, and then you’re like dieting. I mean, it works, but is it maintainable? Is it maintainable? So yeah, if we can carry this out longer, that’s important. But the scientific perspective, it’s just one thing at a time, for life. And you can see, okay that’s your experiment. Shawn: I mean, that’s that science. If we do too many things at once, it can get too overwhelming. It may not be maintainable long-term. And then we also don’t know what worked and what didn’t work. If your doctor gives you six drugs at once and you’re like, I can’t sleep and I’m having an issue with frequent urination, which one was it? You don’t know. Shawn: You don’t know. But if you were to start one of those at a time, you’d know. Shawn: And that’s what we’re saying here. It’s got to be for life. Shawn: So let’s get rid of cheats and self-sabotaging and diets and all of it, and just say, “Healthy behaviors for life. What can I do?” And I think healthy behaviors beget healthy behaviors. Shawn: And putting healthy people around you beget a healthy person. So the more you can do to put yourself in the right position, just like you were saying, avoid that Walmart where you can see your junk food. Well, maybe avoid that junk person—s/he may be a big reason why diets don’t work. Shawn: That has an unhealthy mindset. Because you can hear the words people are saying, right? And we were just talking about this. This kind of goes back to the Four Agreements, which is one of my favorite things. That people are literally making agreements all the time with themselves, and sometimes it’s been conditioned to them, like people have said it to you so many times. You could take the most beautiful girl in the world, for example. I don’t know who that is. Shawn: Or like we were talking about, when something bad, like, “Typical. Yep, yep. Just my luck.” All that stuff says something about where your mind’s at. Shawn: The health of your mind. If you get in that car accident—I think we talked about this before. I’m sorry, not in a car accident, but if there’s a car accident in front of you. Shawn: And, you know, you’re stuck there in traffic and everyone says, “Man, I’m going to be late.” Man, you’re not that person that may be dead. You’re not that person that just had their life altered, at least, pretty radically. Maybe there’s a lawsuit, maybe there’s an injury, maybe there’s death, maybe there’s something that was horrific that potentially happened, and you’re just stuck in traffic. Maybe listen to the news a little bit more, maybe meditate a little bit, more maybe call your mom, maybe call your significant other. And be thankful for life. Everything’s about mindset. So, if you want to be a winner, you have to have the mindset of a winner, right? Tim: Yeah. That’s powerful. I’m almost reluctant to go back, but there’s some things that I wanted to touch on. Tim: First, going back to the dieting side of things, I think it’s great that you distilled things as simply as you did there, before you got into that really powerful moment. And that we talked about one thing at a time and things like. And what that brought to mind for me was that for most people, they get really geared up about the diet. It’s like, “I’m starting this diet on Monday,” or “I’m starting this diet on New Year’s,” and it’s like a week or two of preparation to get ready. Because you know why you have to take that long to prepare? Because you’re changing everything at once. Tim: Right? So there’s all this change going on. There’s all this gearing up. And then you slip up and it’s like oh crap. I mean, this was like a whole big development. And we talked about we’ll change things one at a time. So it’s not as much gearing up for it. You’re just doing one thing that you can focus on. And we can get into more of that in an upcoming episode where I think we’re going to talk about some of the things you can do right now, today, to get better, and give some specific examples. But my other point there was going to be that radical change usually results in radical results. So if you want fast results, then making a lot of changes at once can usually get you there. However, if you want more sustainable, lasting results, it’s usually this behavior lifestyle-related approach that gets you there. But my point there is it’s going to be a little bit slower if you do one thing at a time instead of 20 things at a time; however, you’re going to find out what works. More importantly, what works for you. And you’re going to find out how to get there and stay there for the long haul. Shawn: And that’s how Edison was a great inventor. He changed one thing at a time. He made notes on it and said, “Okay, this didn’t work. Okay, I saw these results when I did this.” He’s changing one thing at a time. He’s taking notes. And this is how greatness happens. Shawn: And it’s kind of like a sarcastic comment about how much preparation goes into being lucky. And if you look around, and again, this is self-sabotaging talk. If you talk about “Must be nice. I wish I was that lucky,” or “I wish I was that genetically gifted.” Well, maybe that person isn’t genetically gifted. Maybe they have other battles they’re fighting. Shawn: Maybe that person has worked extremely hard to get that money and sacrificed a lot of other things in their life. Like we’ve talked about, the suicides that we see all the time, like Chris Cornell and Chester Bennington. Very talented people, loved people, had families, loved worldwide, incredible musicians, and they killed themselves. So you don’t know what someone’s struggling with. Don’t project your struggles on someone else. Shawn: We’ll just leave it there, and we got more to come, but I love this episode. I love all the episodes. Tim: Yeah, it’s awesome. We really appreciate you tuning in and the toxic thoughts that Shawn had talked about there at the end, if you find yourself in that position, we want to help. We want to help bring out the positive. We want to help detoxify your mind. Tim: So keep tuning in. We’re going to give you some more support, some encouragement to get you out of that mire. And a great place for you to start would be to head over to the BioTrust Facebook page, our VIP community. Tim: If you’re not already a member, just head over to Facebook and search “BioTrust VIP” and we’ll accept your entrance, and you can ask questions there. We’ll coach you up, but more importantly, we’ll provide you with social support and accountability, to help you continue it better. Shawn: Absolutely. And if you do have real struggles, darker struggles, it would be good for us to mention this here to seek out help, even beyond. Our VIP Facebook group is awesome and our coaches are awesome. The BioTrust community is awesome. Hopefully this podcast is awesome for you. But seek out real help if you need it. If you’re listening to this and you’re in a really dark place, then seek a professional like your wife or call a hotline. But get help now and don’t wait. We love you guys. Thank you for listening, and tune in to the next episode. We really appreciate you, and thanks for giving us a chance and a listen. Talk to you soon.